At some point in their gardening lives many hosta gardeners consider a raised bed for young plants or seedlings. These beds allow very young or recovering plants to be grouped together for easy care, monitoring, and watering. Until hostas (other than minis) are big enough to comfortably be called "gallon pot size", they require more care than established plants in the garden. Those who grow seedlings too need a place to grow them on in their first season outdoors. Most of the raised beds I'd seen prior to building mine were made of wood. Some of the older ones were already rotting and beginning to collapse. One thing became immediately clear: wood will rot - it is just a question of how long it takes to do so. I wanted to do this project once - not build it over again every few years, so I wanted a material that would stand the test of time and the elements. Not only a material that would last, but one that wouldn't cost a fortune and didn't look too bad. Layout diagram for the constructed bed. My choice was the common cinderblock. I chose it because it is essentially a product made specifically to last indefinitely in contact with soil. Many basement walls including ours here are constructed of cinderblocks, and it is safe to say that they are infinitely preferable to wood for that purpose. Not only are they virtually indestructible, but they have a neutral grey color that doesn't stand out. And did I mention that they're pretty cheap, too? The only real drawback to cinderblocks is the open two-hole top of the block, and this is easily remedied by adding matching patio block of the same material, which is easily available in the same size. These patio blocks may also be found in different colors if desired. It can also be stained or painted if desired. This How-To article is about building a simple, long lasting, effective and cheap raised bed. Depending on your choice of options it can be done for well under $100, or can be several hundred if you decide to use Texel and hardware cloth and have to buy whole rolls of each. Once you know where you are going to build it, measure the area to determine how many cinderblocks you will need. The common American cinderblock is 8"x8"x16" and the patio block for the top is also available in 8"x16" size. In the diagram pictured here, I mapped out an L-shaped bed to fit an area behind the garage. I've included my simple design tool with this article to make it easy to calculate how many you need and how to lay them out. When you know how many you are going to need, choose whether you want either of the options listed below. Gather all materials and when you have them all onsite you can start putting your new bed together. 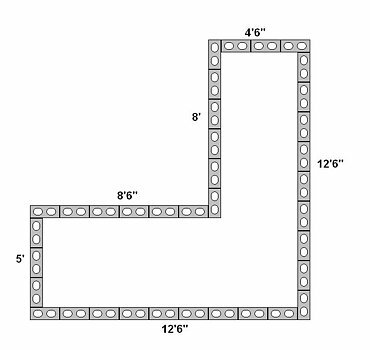 The first step in building a cinderblock raised bed is to map out and level the area where it will be built. For a more solid foundation, I recommend trenching to a depth of at least a few inches and filling the trench with sand, small gravel, or stone dust. 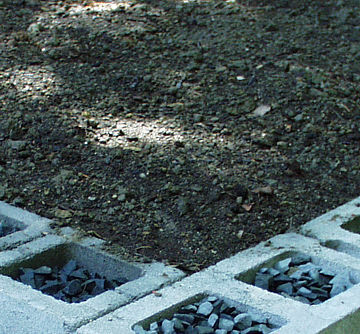 You can get away with just placing the blocks on tamped-down soil, but preparing the foundation will give better results. You don't need perfectly flat ground for one of these, but they shouldn't be built on any more than a slight slope. If you have any more than a few degrees of slope, you will need to hammer in some rebar or other strong metal staking to keep it from sliding when it is full of water after heavy rains. To level out the foundation so the blocks lay flat and straight all you need is a length of twine and two stakes. Make sure high spots are leveled out and low spots are filled and all foundation material is well packed and stamped down. First lay out either optional material if desired. Once this is down, begin laying the cinderblock on top. 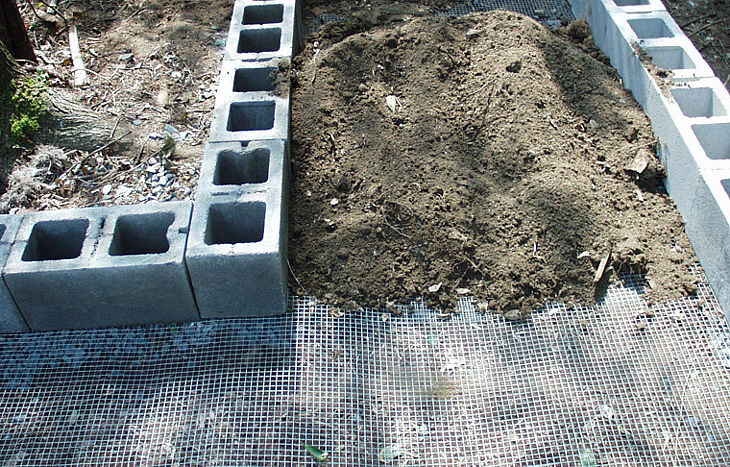 This how-to is about building a simple single layer dry-laid (no mortar) bed. Mortar won't be necessary for a single-course bed, but could be used to help hold it in place and hold the patio block on if desired. To go higher you'll need to consider bracing and mortar to keep the weight of the soil inside from pushing over a wall. Wet soil can exert a lot of pressure sideways on the walls of a bed and may be enough to push over more than one course of cinderblock. One course allows for 8" of soil depth, which is more than enough for hostas. Tip - Lay out the cinderblock starting at the end farthest from where the soil you'll be filling it with. Leave the end closest to the soil open until you have wheelbarrowed most of the soil in. Then put the last blocks in place and finish filling. Fill the bed to at least the top of the cinderblock. Settling over time will reduce the level to an inch or more below that giving a 6" root zone for the plants. Top with patio block. Option #1: If you have voles, mice, or chipmunks, you'll want to prevent them from tunneling up into the bed. This can be easily and cheaply accomplished by laying out a sheet of 1/2" mesh galvanized wire hardware cloth, which is commonly called "ratwire" in some places. It should be lain under the cinderblock to hold it in place. It will last a long time and prevent any attempts to tunnel into the bed. Option #2: If you have tree roots that might invade the bed, especially highly aggressive roots like maple, you can purchase Texel fabric treated with Spinout in 8ft. wide rolls. This is the material that tree-root bags are made of. Lay it out under the cinderblock and overlap widely where necessary. This is highly effective at preventing roots from invading the bed. If you live in a cold winter area, I recommend filling the holes in the blocks with soil or better yet an insulating material to keep the edges of the bed from experiencing lower temperatures than the surrounding soil. I have had problems with winter temps on very small plants around the edges. The photo at right was taken two years after building the bed, and tree roots had begun lifting two of the cinderblocks. With simple dry-laid walls the repair is much easier than it would have been had they been mortared together or set in concrete. Another cinderblock cracked and had to be replaced, presumably because of a flaw in the material. For my raised beds I used 2/3 fresh topsoil mixed with 1/3 decomposed leaf compost from the town dump. To this I added a fair amount of ordinary 10-10-10 granular fertilizer and a 40lb. bag of greensand. I wanted a garden soil mix for the bed to get the small plants adapted to growing in the ground. Fertilizer and greensand were also added. Potting soil could be used, but I can't think of any reason why this would be preferable if the intended destination of the plants is the ground. The plants going into this bed will next go into the garden when they have grown somewhat. By growing them in high-quality garden soil they are well-adapted to growing out in the garden and will not suffer any setbacks when they are moved to their garden spots. 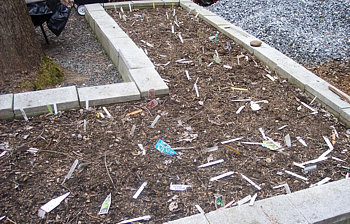 If the plants in the bed are to be potted after they have grown, it would make sense to fill the bed with potting soil. To help design the layout, I'm including the diagram tool that I used to lay out the bed shown in the above pictures. It is a simple bitmap file that is easy to use in Windows Paint. Mac users must use a program like GraphicsConverter or Seashore. To use this tool Windows users can open this tool in Windows Paint. Click the tool called "Select" on the toolbar at left. It is the square tool at the top of the right column on the toolbar. It will give you a crosshair-shaped cursor. Draw a square around a cinderblock in the upper left. Select "Edit" above, then "Copy" in the dropdown menu. Then Select "Edit" then "Paste" and another cinderblock will appear. You can drag this to where you want it. Horizontal and vertical ones are available, as are multiple ones. When you are ready to lay your bed out, draw a square around the big L-shaped example not including the single cinderblocks and "Edit" then "Clear Selection". Copy, paste, and drag to build the shape you want. 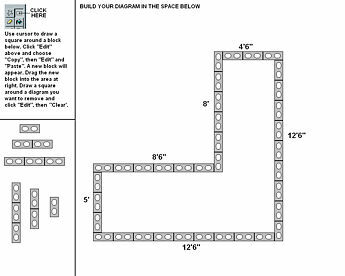 All blocks are 8"x16", so use a calculator to multiply the number of 16" lengths and 8" lengths to determine both how many blocks you'll need to fit your space and how to lay them out. Download and save this layout tool on your computer, then open it in Windows Paint or a similar Mac program. With a little practice you can easily lay out your design to work out how many cinderblocks you'll need. Editors Note: The bed shown in this article was built in the fall of 2003. The garden of Carol Brashear and Bill Meyer will be included on tours of the 2011 AHS convention, and attendees can see how this bed has held up after 8 years of service.